Lawrence Yun, NAR chief economist, said the current sales numbers don’t fully take into account other data. “The latest decline in contract signings implies more short-term pullback in the housing sector and does not yet capture the impact of recent favorable conditions of mortgage rates,” he said. Yun added that while pending contracts have reached their lowest mark since 2014, there is no reason to be overly concerned, and he predicts solid growth potential for the long-term. (more here). The chart below gives us a snapshot of the index since 2001. The MoM came in at -0.7%, up from a 2.6% decrease last month. Investing.com had a forecast of 0.7%. Over this time frame, the US population has grown by 15.9%. For a better look at the underlying trend, here is an overlay with the nominal index and the population-adjusted variant. 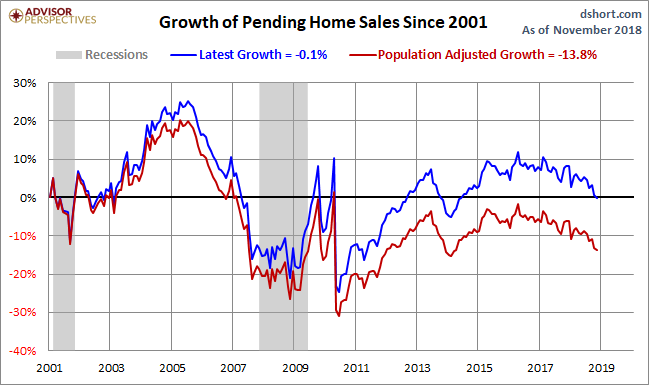 The focus is pending home sales growth since 2001. The index for the most recent month is 20% below its all-time high in 2005. The population-adjusted index is 28% off its 2005 high. 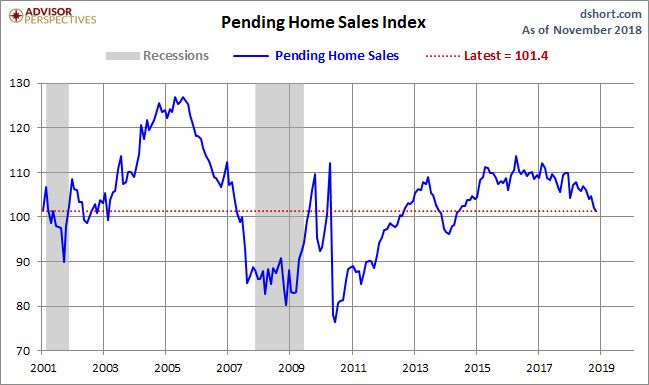 The NAR explains that "because a home goes under contract a month or two before it is sold, the Pending Home Sales Index generally leads Existing Home Sales by a month or two." Here is a growth overlay of the two series. The general correlation, as expected, is close. 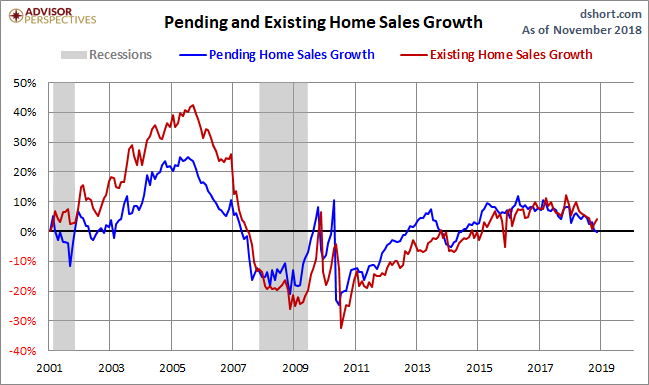 And a close look at the numbers supports the NAR's assessment that their pending sales series is a leading index.